My friend Becca, from Frugal Wannabe, is awesome. She’s a homeschooling mom of 4 kids and she just makes me laugh all the time. 🙂 I just love having encouraging folks in my life! Becca was recently diagnosed with a gluten allergy, so I asked her if she would share a gluten-free recipe today…y’all ask me for those so I have to get help. Thanks Becca! I was recently diagnosed with a ridiculous amount of allergies, the main ones being dairy, wheat, and eggs. Oh and chocolate. Isn’t that pitiful? What kind of person can I be without chocolate? For the most part, the whole family has gone gluten free at home. I have to say it’s not easy, because these items are in almost everything. What I’ve done quite often is tweak a recipe that calls for one or more of these ingredients, and substitute what I am able to use, at least until I can experiment more. That’s what I’ve done with this recipe. Smashing stuff is fun! This took up 2 ungreased cookie sheets. When cookies are done, cool on a wire rack if you’re strong enough to resist. I’m not. I ate one warm. It was awesomesauce. Melt your butter, then in the same pot, whisk in the 1 cup of sucanat and egg until smooth, then whisk in the sorghum. In a separate medium bowl, whisk the dry ingredients in, except for the ½ cup of sucanat. Make a well in the center, and add the wet ingredients. Chill the dough in your fridge for 1 hour. Preheat your oven to 375, or 350 if you use a convection oven. Take out your dough, and shape it into walnut-sized balls, and roll in the remaining sucanat. 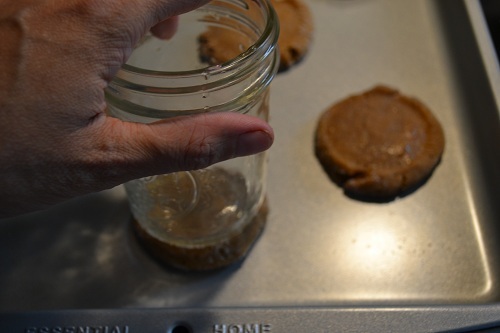 Place on cookie sheet about 2 inches apart, and flatten with the bottom of a glass. This took up 2 ungreased cookie sheets. Place them in the oven for 5 minutes, then rotate and bake for another 5 minutes. Cool on a wire rack . Becca has been married to her insanely handsome husband Jeremy for 14 years, and they have 4 children ages 10, 9, 7, and 3. She is a stay-at-home Mama and homeschools her kiddos. She enjoys cooking, knitting, and raising chickens. She does not, however, enjoy washing dishes or cleaning anything. You can find her at Frugal Wannabe She doesn’t post every day, so don’t mind that. Hi Becca, I hope you are adjusting to your diet, that’s a lot of allergies to start avoiding at once! 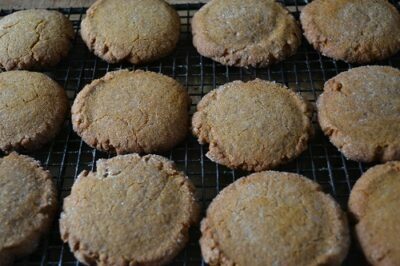 When I saw ‘sorghum cookies,’ I assumed it was sorghum flour. I admit I had never even heard of sorghum sweetener, but now I’ve read this NYT article and am up to speed: http://www.nytimes.com/2011/12/28/dining/sorghum-a-southern-sweetener-to-remember.html?_r=0. Are you in the South? I’m in the Seattle area. There are lots of alternative sweeteners at my food co-op but I’m pretty sure sorghum isn’t one of them. The idea of a less-harsh molasses taste is intriguing, though, I’ll have to keep my eye out for it. 🙂 Yes, we live in the South…..Tennessee. It’s a common staple around here. I’ll have to try to sample some and maybe pick up a bottle next time I get to the South! Becca, THANK YOU for this recipe! I am like you…I just experiment here and there, but being GF is HARD! Actually, I am JUST now–like TODAY–going GF because of some issues with my newborn I am nursing. My 4 year old has been GF for just over a year, and my 2 year old is GF as of this week. Guess my hubby will go GF as well unless he’s out! 😉 Pinning this recipe for sure! Gotta try this recipe… Sounds yummy! My daughter was diagnosed almost two years ago with gluten intolerance and lots of food allergies. Finding a GF All purpose flour was near impossible. However, we ran across Bob’ Red Mill gluten free all purpose baking flour. The ingredients are: garbanzo bean flour, potato starch, tapioca flour, white sorghum flour and fave bean flour. My daughter really missed chicken tenders, and this flour lets her have those as well as steak fingers! I hope that helps someone, thanks for the recipe. What type of GF all purpose flour was used? There is such a variety of blends- some with rice flours, some with bean flours, etc etc. We have an GF all purpose that I made up with various rice flours- it subs great into some recipes, but horribly into others- Unfortunately, I tried some molasses cookies just a couple of weeks ago with that flour and they..”fell flat” if you get my drift! Knowing what kind of GF flour was used could help give me an idea if this one will work with mine! Sorry to inform you, but the Cookie recipe you entered on September 24 is NOT Gluten free. GV Flour is made from Wheat and Wheat is the first grain a Gluten free person would eliminate. Hi Brenda, I think maybe you read the post wrong. Becca states to use GF Flour in the recipe…which is “gluten-free” flour. 🙂 I’m not sure what GV flour is, but I can’t find it in the post….